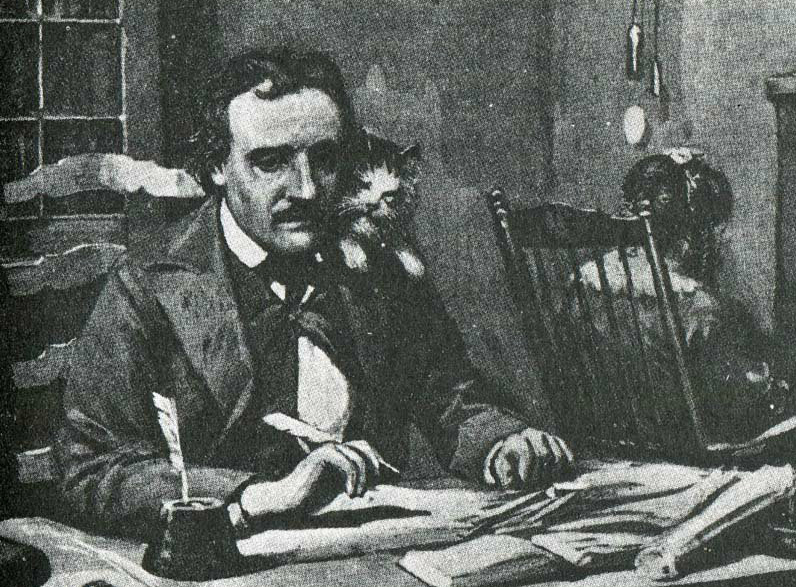 Writers and cats go together like pints of ice cream and spoons, so it’s no surprise that Edgar Allan Poe’s cat makes the list. While Poe wrote a terrifying (of course) tale called “The Black Cat,” his actual cat was a tortoiseshell, named Catterina. She reportedly perched on his shoulder as he sat down to write, probably to give him storytelling pointers. Catterina also tended to Mrs. Poe, who was losing a battle with tuberculosis, by lying next to her to keep her company until the end. Catterina reportedly died shortly after Poe himself died. Perhaps she was a figment of Poe’s imagination, or, more likely, he was a figment of hers. 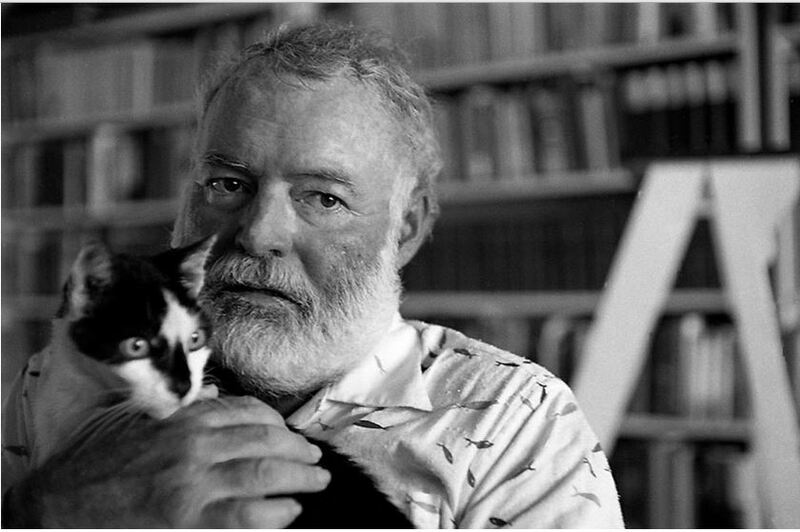 Renowned writer Ernest Hemingway kept many cats throughout his life, but his first was an all-white kitten named Snowball gifted to him by a ship captain named Stanley Dexter. 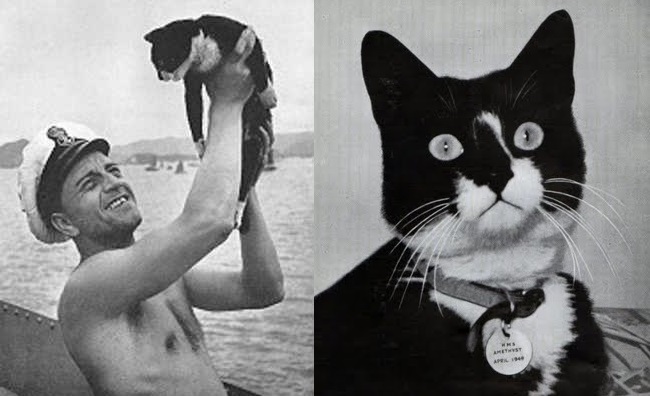 What made Snowball unusual is he was polydactyl, having six toes on his front paws instead of the usual five — cats with extra toes are considered lucky at sea. Snowball lived a nice happy life in sunny Key West, Florida. Why he is so famous is that his many descendants still live at the Ernest Hemingway Home and Museum, and many of them also have extra toes. And in 2017, all 54 of the current generation of Hemingway cats survived the wrath of Hurricane Irma, so I guess they’re lucky on land, too. 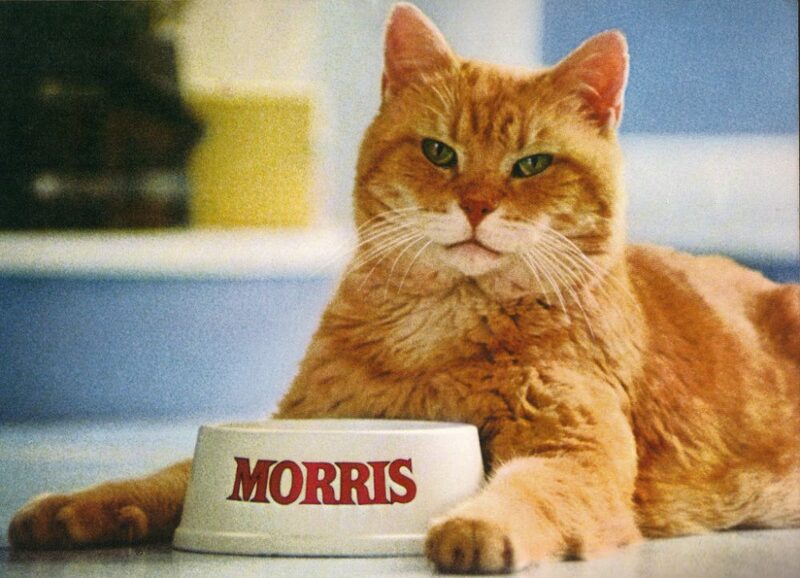 Probably the most famous advertising cat in the world, Morris started out as the spokes-purrson for Purina’s iconic pet food in typical Hollywood fashion — he was discovered by talent scouts. Adopted from a shelter, the “finicky” orange tiger-striped cat first appeared in print in 1968, and until 1978 was the most popular cat in the world. When the original Morris died, a new Morris — also a rescue cat — took up the mantle as pitch-cat. There have been other Morrises to follow since, as a beacon not only for pet food, but also pet adoption and rescue. The current Morris is living it up in Los Angeles, California. Koko the gorilla, the first non-human to be able to communicate in sign language, had a simple request for Christmas in 1983: she wanted a kitten. Her research team tried giving her a stuffed toy but she wanted a real one. After much deliberation they decided to let her adopt a kitten for her birthday in 1984. Koko chose one out of a litter, a male Manx kitten with no tail, and signed the cat’s name as All Ball. 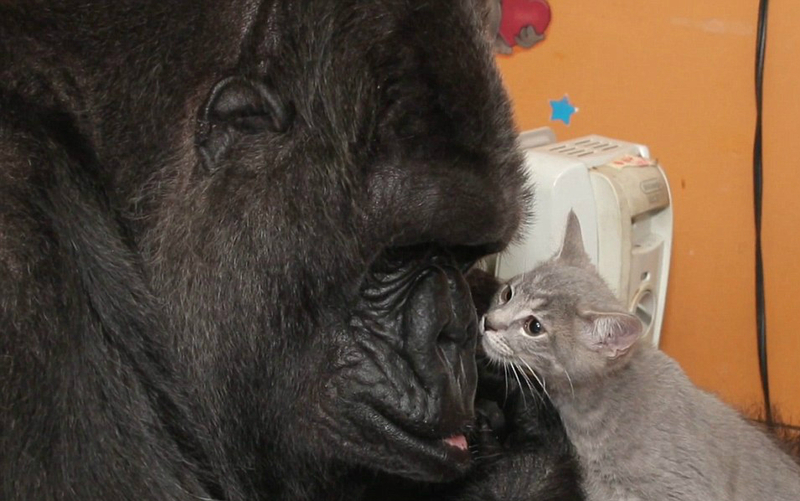 Koko and All Ball made headlines all over the world as she took gentle care of him as if he were her baby. But it was not to last; after just a year together, All Ball got out of the research building and was struck by a car. Koko was inconsolable, signing “bad sad” over and over again. While she eventually got more kittens, she never forgot All Ball. 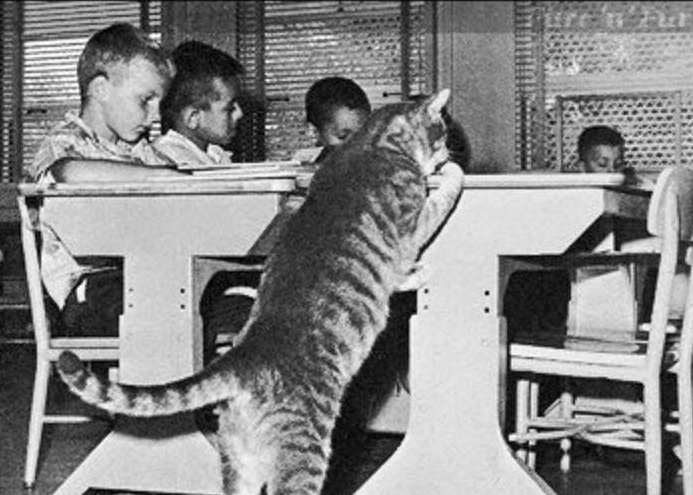 Room 8 was a huge gray tabby that wandered into Elysian Heights Elementary School in Southern California one day in 1952. Named for his “homeroom,” he patrolled the grounds fastidiously; he came to school every day during the year and during summer recess we assume he took a sabbatical to a bird sanctuary. He became the school’s mascot and was beloved, subject of books and movies and even a fashion spread in Look magazine. He finally retired over the Rainbow Bridge at 22 years old, and was buried with honors at the famous Los Angeles Pet Memorial Park. This cat may not have polydactyl toes but he sure was lucky, though the same can’t be said of his ships. His first assignment was on a very famous vessel; unfortunately it was the Bismarck, a German battleship famous for A) being supposedly unsinkable and B) being sunk on its maiden voyage. 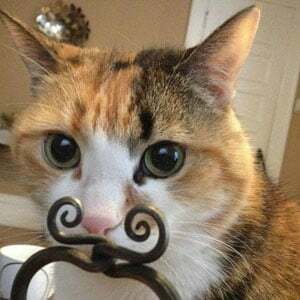 The cat was found floating on bits of shipwreck by the British Royal Navy and brought aboard, and given the name Oscar (what his name was aboard the German ship is unknown). He then went on to sink two more ships in the same way, and was renamed Unsinkable Sam. The Navy finally got wise and gave Sam to a sailor who had gone ashore, and as far as we know, caused no more maritime disasters. 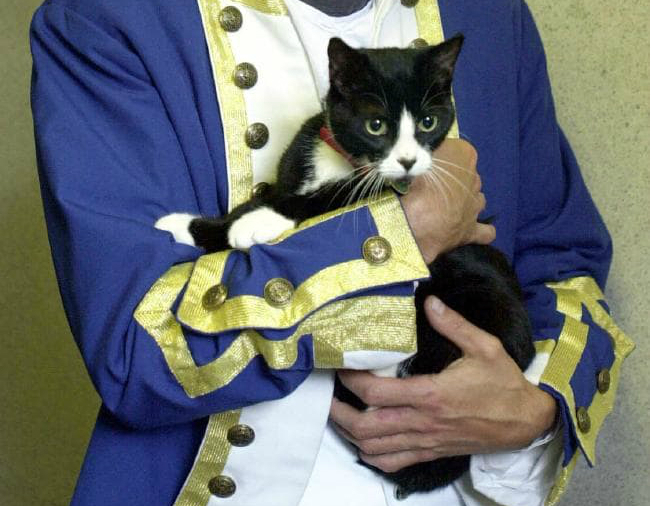 Way back in the late 18th century, when sailing around “discovering” things was a career, Captain Matthew Flinders took his cat with him. Trim, a tuxedo, served on Flinders’ ship HMS Reliance and then on HMS Investigator, which mapped the entire circumference of Australia between 1801 and 1803. However, on his return to England, Captain Flinders was captured by the French, because of a little war with Napoleon, and he and Trim were imprisoned on the island of Mauritius for a time. Flinders survived and was released; Trim however went missing and Flinders assumed he was eaten by another prisoner. There are statues of Flinders and his faithful companion Trim in both his English hometown and in several Australian cities. Tabby and Dixie were two kittens gifted to President Abraham Lincoln by his secretary of state William Seward in 1861, and they became the first official White House pets. 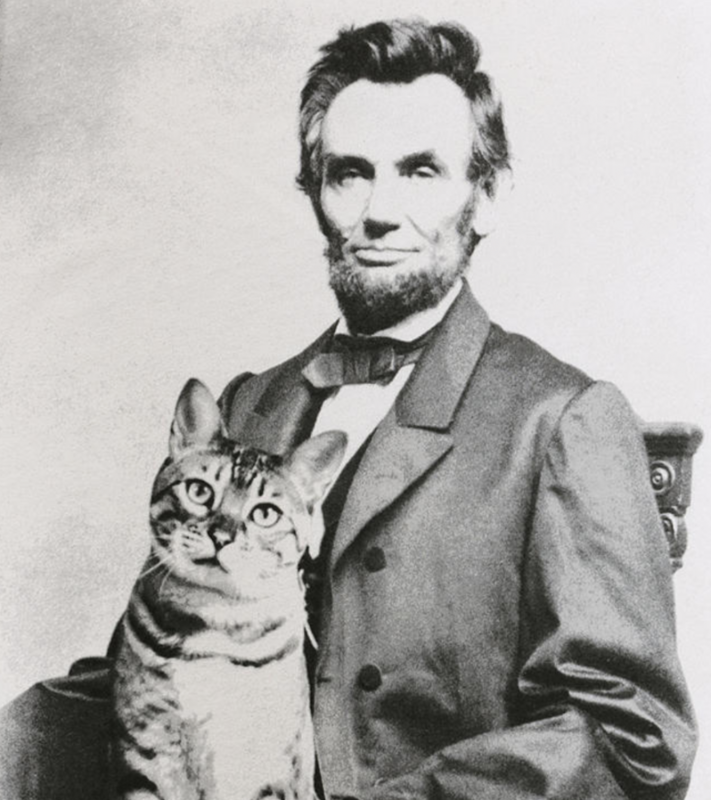 Although technically Tabby belonged to Lincoln’s son Tad, Tabby and Abe were fast friends.